WATCH: Hillary Clinton accepts Democratic presidential nomination. "It truly is up to us. We have to decide whether we will all work together so we can all rise together," Clinton said in an address on the final night of the Democratic National Convention in Philadelphia. The 68-year-old Clinton is the first woman ever nominated for president by a major U.S. political party. She won the nomination after defeating her principal rival, Vermont Senator Bernie Sanders, in the state-by-state process of primary and caucus votes. "I want you to know I've heard you," Clinton said. "Your cause is our cause." 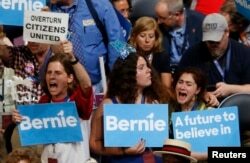 Supporters of Senator Bernie Sanders (D-VT) react as they listen to him speak during the Democratic National Convention in Philadelphia, Pennsylvania, U.S. July 25, 2016. She pledged to work to create more jobs with higher wages, saying the country does well when the middle class thrives.Clinton also said she has no interest in taking away people's guns, but wants to enact reforms to prevent people from being shot by those who should not have access to them. 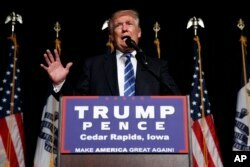 Clinton's principal challenger in the general election is Republican nominee Donald Trump. Both candidates suffer from negative perceptions among voters, as revealed by multiple polls during the past year. Those same polls show about 30 percent of voters view Clinton as trustworthy, even as one from Gallup showed her as the country's most admired woman. One source of that distrust is her use of a private email system during her time as secretary state, which was the subject of a congressional investigation and a probe by the Federal Bureau of Investigation. The FBI concluded Clinton's actions were "extremely careless," but did not warrant criminal charges. "I did not hear any kind of contrition or acknowledgment of the questions about her email server," Kondik told VOA. "I personally thought that it would have been a worthwhile thing to sort of make at least an oblique acknowledgment of that issue. Obviously she and her advisors decided not to do that." Republican presidential candidate Donald Trump speaks during a campaign rally, July 28, 2016, in Cedar Rapids, Iowa. Clinton said Thursday that Trump wants Americans to fear the future and each other, and she took aim at some of the proposals he has put forth during his campaign, including building a wall at the U.S.-Mexico border and banning Muslims from entering the country. She further criticized what she called "the bigotry and the bombast" of the Trump campaign and cast his temperament has unfit for the presidency. "A man you can bait with a tweet is not a man we can trust with nuclear weapons," Clinton said. After Clinton's speech, Trump posted a flurry of Twitter messages, including saying she was unfit to be president because of what he called her "refusal to mention Radical Islam" as she advocates allowing more refugees into the United States. "No one has worse judgement than Hillary Clinton - corruption and devastation follows her wherever she goes," he said in another tweet. 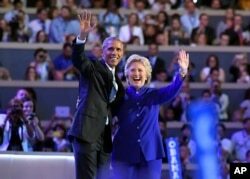 President Barack Obama and Democratic Presidential candidate Hillary Clinton wave together during the third day of the Democratic National Convention in Philadelphia , July 27, 2016. The convention in Philadelphia brought together the biggest names in the Democratic Party to put forth why they think Americans can trust Clinton and why they believe she is the superior choice to lead the country when President Barack Obama's term ends in January. Obama said Wednesday no man or woman has ever been more qualified for the position. Vice President Joe Biden said of Trump that no major party nominee has been less prepared to handle the country's national security. Clinton's running mate, Virginia Senator Tim Kaine, called Trump a "self-promoting, one-man wrecking crew." "I've been watching these speeches at night, and boy am I getting hit," Trump said at an event Thursday in Iowa. "I am getting hit and they don't mean it and there's a lot of lies being told." Voters will make their choice on November 8, and the new president will take office on January 20. Kondik also said the majority of voters have already made up their minds, and that the conventions help solidify those choices. Elizabeth Cherneff contributed to this story.